In our day-to-day lives, much of what we experience is mundane and ordinary. We tend to focus on our personal daily small ‘crises’: from the 7.42am bus running five minutes late to the internet slowing down when the rain is particularly heavy as the local exchange is vulnerable to such weather; or the frustration when the barista we like from my favourite café is not working and the coffee is not strong enough: these ‘problems’ of life distract us. Beyond the walls of our comfortable homes and the borders of our wealthy nation, the everyday experiences of the majority of the world’s population are vastly different. A recent report by the independent non-government organisation World Watch, for example, conservatively estimates that in 2012, 92.6 million people were forcibly displaced either inside their own countries or across borders. The reasons that people were forced to leave their homes and belongings, as well as their communities and families, ranged from warfare and persecution to natural disasters and ‘development’ projects. It is close to impossible to imagine what it would mean to leave everything behind and squeeze what you can into a suitcase. Decisions become final: which few photos do I choose? Which clothes are the most versatile? What of the items that remind me of my faith but risk me being persecuted? Such stories are all around us: from the refugee who made it to our country and now fights a system that is prejudiced against them and deaf to their plight, to the nightly news bulletins of war and displacement in far away places such as Syria and the Congo. In fact, we are often over-saturated by such images and have learnt to turn off: quickly changing the channel or moving to the entertainment section of the newspaper. Are we now destined to turn our backs on such suffering because we are so overwhelmed and disempowered? What can make us turn back and witness the suffering and ask ‘what can I do?’, not with a sense of futility but with the determination of ‘hope’? Now, more than ever, this is the role of the artist: the painter, the slam poet, the playwright. In his latest work, this is exactly what Luke Cornish achieves. Travelling to the refugee camps of Lebanon and surrounded by the sound of gunfire, Luke draws on his artistic skills to bear witness to the suffering, hope, violence and everydayness of the displacement and conflicts. Luke acts as our witness. What Luke does here is present us with works that act as a looking glass through which we can see the darkest elements of crumbling societies – where we could be if not for the accident of our birth. We see the collapse, conflict and displacement of once vibrant worlds. But again, as Luke finds in the bleakest corners of the world, he finds reasons to celebrate the resilience of communities and the continued sense of hope despite the surrounding despair. 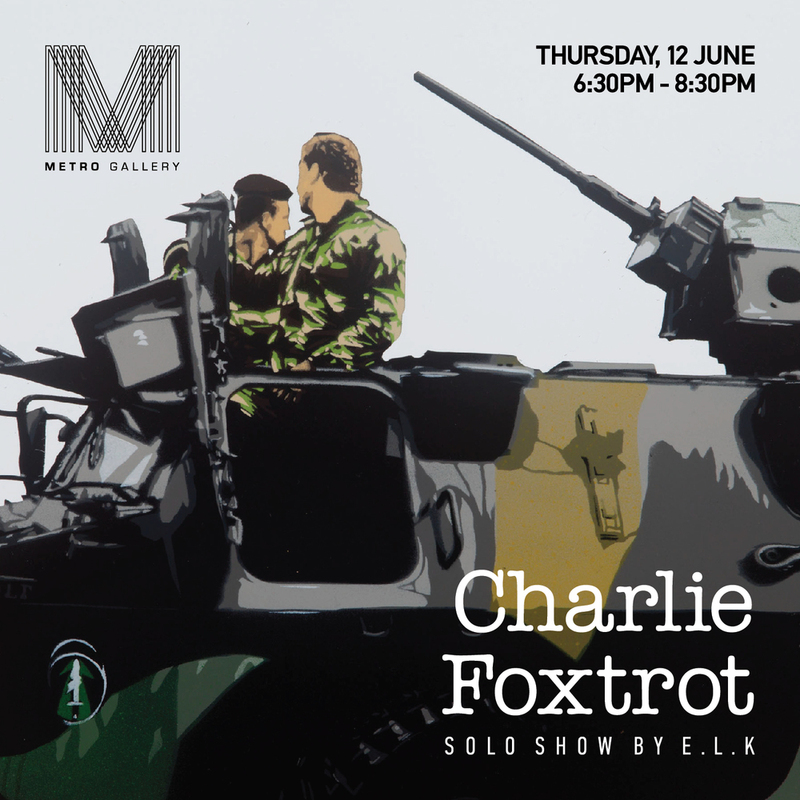 This collection of works can be contrasted to his 2013 exhibition, Before Afghanistan, which focussed on Australia’s soldiers, their anonymity, battle armour and weaponry. While the Australian soldiers in their armour looked alien, Luke now takes us on an intimate journey. While the anonymity of Australian soldiers almost repelled us, the vulnerability of the displaced and those whose daily lives are surrounded by conflict draws us in: this, for better or worse, is now their home. In contrast to the browns and black and the almost uniformity of the soldiers, this exhibition is one of difference and disparity. We are presented with the multiple dimensions that capture the mixed emotions and juxtaposition of zones of conflict. His layers of stencils and paint capture and reflect the layers of complexity and emotion he attempts to capture. Luke portrays two brothers in a shared moment, staring at something just off the gaze of his portrait. These are traders, Luke tells us, who continue their family business of buying and selling fine fabrics. There is also the old man wearing a ‘Real Chicken’ t-shirt capturing us with his contemplation and disarming us with his relaxed posture. Then there is the woman carrying her infant child: is that a look of desperation or defiance? Will she make it through the day? What happens to her and her child after this image? There is the powerful contrast of the ‘outsiders’. The vulnerability of the man struggling to carry two full suitcases: these suitcases do not have wheels to ease his burden – and if they did, they appear to have fallen off years earlier. The load heavy on his shoulders, we wonder what these cases contain? What choices and sacrifices did this man make in filling them up? We can contrast this moment with that of the other outsider: the reporter in her blue ‘Press’ jacket, smiling. Her film crew stare at us protecting the camera equipment with an umbrella. Unlike the desperate man running with the suitcases, she has chosen to be here. She too has made certain sacrifices – but ones that are very distinct from the displaced. Finally there is the ominous anonymity of the insurgents: carrying high-powered weaponry, their faces hidden, their body language menacing. Luke captures their thin, protein-deprived bodies. Are they trained soldiers or random militia who picked up arms from desperation and lack of choice? All these figures ‘float’ in a white background making them feel simultaneously distant and approximate. Surprisingly, this aids our ability to witness the lives portrayed by Luke through his unique looking glass. We should never underestimate the concept of ‘the witness’. Prominent philosopher and feminist Kelly Oliver, draws out attention to this word ‘witness’. Oliver discussed the concept of witness as having a ‘double meaning’: either being an eyewitness or bearing witness to something that may well be the unseen. To witness something, Oliver argues, both directly and indirectly provides the promise of building a connection with someone – be they friend or stranger. Witnessing offers the possibility to address and respond to what we have seen – it can create a sense of ethical obligation. When we turn away, we refuse to witness. But Luke responds to this instinct by providing a looking glass through which to see the crises confronting large sections of the world population. We are encouraged to witness – and how we respond is ultimately up to us. Once again, Luke’s work crosses the boundaries, taking us from ‘street art’ to the gallery. More importantly, however, is the boundary that he forces us to confront – from looking away to witnessing the horrors of war and displacement. This work, like that which has preceded it, confirms why Luke is such a valuable artist for our times.